Our local public radio station was having one of its ubiquitous fund raisers, offering as an incentive a twelve-day photo safari in Tanzania. Each time they promoted the safari, I sat up a little straighter, not because I thought for a minute that I could be the lucky winner, but because I’d been meaning to write a Tanzania-related blog post and the constant reminders made me feel guilty. So, without further procrastination, here it is. According to Wikipedia, although East Africa was handed over to the British after World War I, “In the late 19th century, Imperial Germany conquered the regions that are now Tanzania (minus Zanzibar) and incorporated them into German East Africa,” which might explain why there was a particular German doctor living there at the beginning of World War II. That doctor wanted to return to Europe and was willing to barter the medical practice they had in East Africa for property in Austria. And that’s how my mother-in-law came to spend a number of her childhood years in East Africa. It’s a fascinating story, but it’s hers to tell so I won’t go into it now. However, because of her story, I am particularly intrigued by all-things-Tanzania. 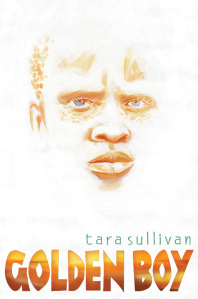 Tara Sullivan recently published her first Middle Grade novel, Golden Boy, about a thirteen-year-old albino in Tanzania, named Habo. His father abandoned the family after Habo’s birth. They are evicted from their home and forced to leave their village to go live with relatives in Mwanza. During a harrowing trip across the Serengeti, Habo learns that there are people who believe that albino body parts bring good luck, and that there is a market for those parts. After an encounter with an albino hunter in Mwanza, he fears for his safety and flees, making his way to Dar es Salaam where the rest of the story takes place. Tara knows about alienation and it is clear in her writing. She was born in Calcutta, to international aid workers, and lived in South America and the Caribbean before moving to Virginia at age fourteen. An ivory-skinned red-head, the bright sun of her childhood damaged Tara’s eyes and precipitated her family’s return to the US. Her experiences clearly inform Habo’s story and his voice, which carries all the wonder and pain that comes from being so different. It’s interesting to note that while Habo’s plight sounds like a made-up horror story, it is not; albinos are hunted in Eastern Africa, and for some reason, the number of incidents is higher in Tanzania. You can read more about that at Tara’s web site. You can also learn how you can help albinos in Africa, from simply sending sunscreen, to supporting advocacy groups focused on human rights. When Tanzania was East Africa, it served as a safe haven for my mother-in-law. After reading Golden Boy, you will wish the same for albinos who live there, as well as marginalized people everywhere. This entry was posted in Uncategorized and tagged albinism, albinos, East Africa, Golden Boy, photo safari, Tanzania, Tara Sullivan. Bookmark the permalink. I’m been to Tanzania. It’s a beautiful country. You should try to win that Safari. Wow! Golden Boy sounds like quite a story. I’ll have to check it out. I love your snippets of blog every week! And I just learned something about Bea. I’ve missed a few weeks lately. I’m glad you’re hanging in there with me. I’m amazed how people target difference is such catastrophic ways. I’m glad his story has been told.